I'm not sure if there is enough interest in starting and Incra-specific thread. I have a love-hate relationship with mine (as part of my table saw/router table combo; and would like to hear other views - I'm considering separating the two, with a standalone router system, and I'm not sold on the Kreg or Jessum. I guess I'm having trouble finding a question somewhere Can you be a little more specific on what you like and, probably more importantly, what you dislike? The problem with experience is I usually get it immediately after I need it. Other than that...the whole thing is just great!! "..... limited only by imagination"
"Just smile and wave boys, smile and wave"
Thanks for the follow-up - and John, I should have specified both a question and the dark-side of my experience. I find the Wonderfence to be both short and the two sides (of the split fence) to go out of alignment; as the alignment is predicated on securing each half independently to the main fence. Dust collection seems less efficient than that of Kreg's, due to the placement of the exhaust at the end of the fence, rather than at the Bit. For the question part of this, I was wondering if others find these issues, or is it just my not having experience with other tables and fences as a comparison? regarding the fence alignment... It does not take much in the way of sawdust to give ya fits. Anytime I need to make any kind of split fence adjustment, I make sure that everything is nice and clean. For me anyways, this seemed to take care of the problem. Dust collection I've had pretty good luck with. I pretty much run a 2" PVC collection system. Total travel is about 40 feet with multiple T's and elbows with six ports and I still have excellent collection. I tie my table into a 6hp craftsman shop vac. Collection thru the fence is great, collection thru the table is 'acceptable'. *S* more of a design issue I believe than a mechanical one. I have experienced the poor dust collection on my Incra system as well. I found that opening up the end opposite of the dust collection port helps improve the air flow and more saw chips get sucked into the hose. Thanks, and I had wondered about this for some time, but never tried it - I assume you're speaking of the other end of the split router fence(? ), opposite the dust collection end. I've tried to conceive of how to emulate the 'behind the fence, at the bit' approach of the Kreg (and others), but have not developed a workable approach. I have the INCRA LS-25 Wonder Fence System coupled with an Incra Mast-R-Lift II router lift. I'm very pleased with the accuracy and ease of adjustability on the Y axis (moving the fence to and away from the router bit) and the Z axis (moving the router bit up and down. The X axis (moving stock along the fence into the router bit), on the other hand, is a different story. The right angle attachment does not move smoothly and feels like it may tip over as it wobbles along the fence. 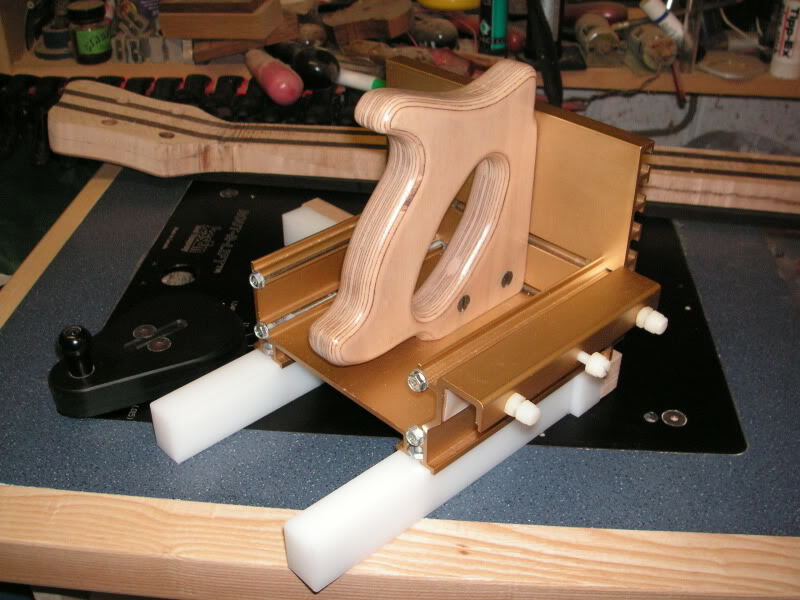 I replaced the two plywood feet with some UHMW material to reduce the drag; also fine-tuned the plate-to-table plane to eliminate a nano-meter high bump that was hanging up the movement of the right angle attachment. There is still drag along the fence due to the nylon screws scraping along the notched teeth that are there to lock down the stops. Placement of the stops is mostly manual; fine tuning of the stops can only be done by turn a phillips head screw. All of this combines to put accuracy and adjustability along the X axis in a class far below those on the Y and Z axis. I guess the engineers at INCRA got burnt out on the project two-thirds of the way through. Regarding the right-angle incra jig, I prefer to use something homemade, rather than the incra attachment. By and large, I don't have the riser attachment or other bolt-ons which came with the Wonderfence package. Since my setup is a Table Saw/Router Table arrangement, I've tried to keep a most common denominator between the router and TS setups - this means very few of the router attachments are used - I use the split fence, which slides on easy enough (though, I sometimes forget to screw-down all four mounting screws), and the dust collection connection is put in place from the fence to my stationary DC run. My thought is by separating this, I'll be more focused on the work. I really love my Incra,I have improved the right-angle jig, and use it with a Jessem router lift and my DW625.